A Gutter Helmet leaf guard system from MR. FIX-IT™ can provide long-term protection for the gutters of your home in Richmond, Virginia, preventing any unwanted debris from clogging them and impeding their function. These systems are among the most sophisticated available on the market, with several cutting-edge features designed to maximize their effectiveness at shunting away debris and maintaining the structural integrity of your guttering. 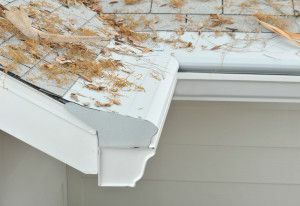 Purchasing a leaf guard system from us will not only ensure that you’ll never have to clean your gutter again, it will also prevent birds, rodents, and insects from nesting and breeding in the gutters of your Richmond home. What makes our leaf guards so effective? Each Gutter Helmet system features a unique nose forward design, which has a sloping, outward-jutting lip that lets gravity pull sticks, leaves, and twigs harmlessly to the ground below. The sloping surface of the leaf guard is also ribbed, and this textured surface takes advantage of the surface tension of water to guide it into a narrow aperture, where water is then funneled into the gutter itself. For additional information about the benefits that our Gutter Helmet leaf guard systems can provide, contact MR. FIX-IT™ today. We proudly serve homeowners in Richmond, VA, and all surrounding communities.